After arriving at your destination, you want to be on your way as soon as possible. Make sure you’re well prepared and have all necessary documents ready. This will help speed up the process. A few things to take into consideration when picking up your rental car are listed below. In the USA and Canada most rental locations at airports are open 24/7. Downtown locations have different opening hours. Rental locations at the main airports in Europe are usually open from early morning until midnight. Check your rental voucher for the opening hours of your rental location. 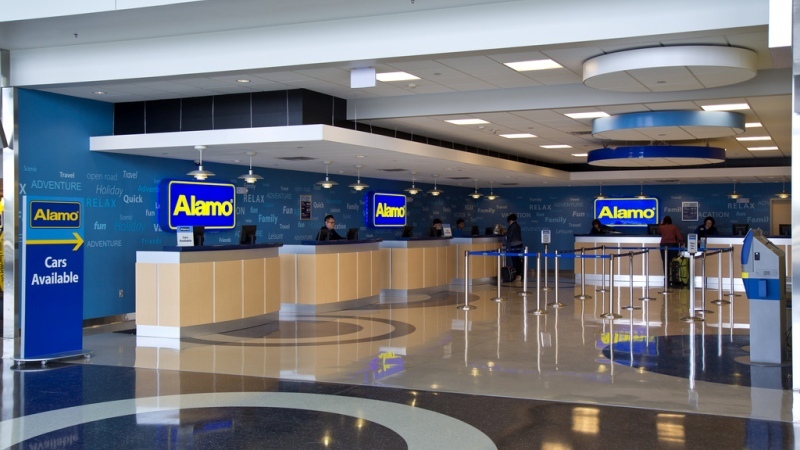 At smaller airports or popular downtown locations the wait time might be a little longer than you would expect from Alamo. Local partners always strive to get you on your way as soon as possible. Some American airports have so called Rental Plaza’s, where all car rental companies are accommodated. The Rental Plaza is usually located at the airport. Most airports have desks in the arrivals hall. The rental cars are located in the parking garage of the airport. In some cases you will have to pick up your rental car at a location nearby the airport. Shuttle buses are available to bring you to the rental location. Make sure you have the following documents ready when you pick up your rental car. This way the employee at the desk can help you on your way soonest. Before you drive off with your rental car, please do check the car for damage. In Europe an employee will walk you to your car and will do a check of the car together with you. You sign a check out form in which all damage is listed. When you return the car the existing damage is already noted so you know you won’t be held responsible for this. It can be wise to take photos of the existing damage before you leave. This way you won’t have any discussion afterwards.